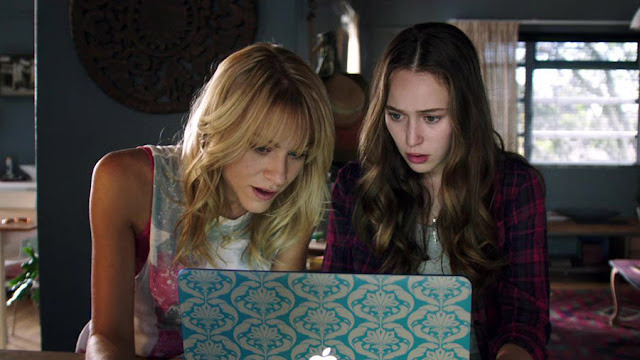 The most important lesson gleaned from Friend Request: Beware the Facebook witches, because they are a real thing and they’re coming for you and your friends! Apparently. And while I won’t go so far as to heap praise on German director Simon Verhoeven’s 2016 (it took a while to make it to U.S. shores) horror film for being particularly original, or even all that memorable, it’s solid genre fun. At times. In fact, it has the makings of an awesome junior high sleepover movie. Laura (Alycia Debnam-Carey, The 100, Fear the Walking Dead) has the perfect life. She’s pretty, she’s smart, she’s one of the most popular girls at her college, and she has a hunky boyfriend. Everything’s all sunshine and puppy dogs. Until she accepts a friend request from Marina (Liesl Ahlers), the overenthusiastic goth girl with zero friends who sits in the back of their psych class and eats her own hair. Infatuation blooms into fixation, and before long, Laura finds herself dealing with an evil presence that kills off her besties one by one. And ruins her social standing on campus! That may be the biggest blow. Taken as a whole, Friend Request plays out like J-horror-lite, a kind of mixture of Candyman and The Ring. Most of the jump scares are predictable and easily spotted. None of the characters offer much of interest. Attempts to make a grander point about online oversharing, isolation, and social media obsession fall flat. (A running on-screen friend tally proves a clunky, intrusive device that provides more unintentional laughs than substance.) And eventually it spins its wheels as the plot repeats the same beat over and over. If you’re looking for something you’ve never seen, look elsewhere. While the whole paints a lackluster picture, individual pieces are remarkably effective. Much of the imagery is familiar, especially to horror fans. But it also occasionally provides legitimate shocks, gruesome moments that will sate the gore hounds, and eerie, foreboding animations courtesy of Marina that manage to be both unnerving and lovely. And for every ham-fisted, obvious jump scare, there’s one that lands—Verhoeven and company hit at least as often as they miss, including one that, hand to god, gave me goose bumps. The plot takes an especially dark turn when it digs into Marina’s past. But like the rest of the movie, while it provides creepy, skin-crawling flourishes, others wind up so overwrought they’re comical. I’ll give Friend Request points for attempting to put a modern millennial spin on an age-old black-mirror magic tale, subbing in computer monitors and iPhone screens for the more arcane tools of the witchcraft trade. And the ubiquitous nature of technology adds an edge—evil can strike anywhere, any time, and everyone essentially carries their own doom in their pockets. Again, it doesn’t always click, but it has moments. While entirely unremarkable, the assembled cast of cookie-cutter students does what they’re intended to do. Debnam-Carey plays the perfect girl who has a sassy blond friend (Brit Morgan) and a spunky chubby friend (Brooke Markham). Their crew also includes a beefcake med school student (William Moseley), a wacky chubby dude (Sean Marquette), and a twitchy, blood-shot-eyed exposition machine who’s “secretly” in love with Laura (Connor Paolo). They all have three notes: BFFs, frazzled from being hunted by evil spirits on Facebook, and dead or about to be dead. This collection of types represents the new-jack spin on the Scream/I Know What You Did Last Summer knock-off roster of yesteryear and serves the same functional, if uninspired purpose.